In honor of Thanksgiving, here are 11 strange, weird, interesting and obscure facts about some of the most popular Thanksgiving traditions. 1. The Pilgrims may not have eaten turkey… but they definitely ate a ton of shrimp and deer. 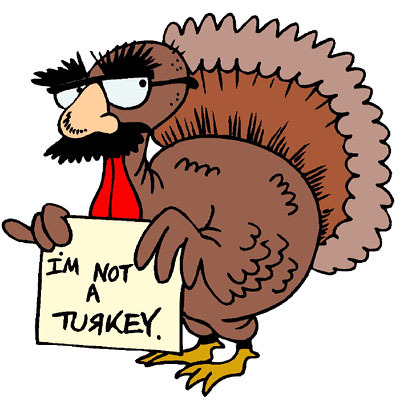 At the first Thanksgiving — 1621 in Plymouth — there’s no hard evidence that anyone ate any turkey. In the best account of the first Thanksgiving (a book called “Mourt’s Relations: A Journal of the Pilgrims at Plymouth” by a colonist named Edward Winslow), there’s no mention at all of turkey. Edward Winslow (not to be confused with Eddie Winslow, the oft-immature brother on “Family Matters” played by Darius McCrary) does say that that the Pilgrims ate “wild fowl”… but that could mean duck, geese, whatever. What did the pilgrims eat? A lot of venison (deer) and shellfish. If you’re wondering how turkey became associated with Thanksgiving, it’s because of two factors. One: Wild turkeys were all over New England back then, so they were an easy option. And two: Turkeys were extremely practical. A turkey was a good family meat because one bird can serve a lot of people. And they don’t produce milk like cows or eggs like chickens, so they didn’t have another utility to the colonists. 2. Thanksgiving wasn’t an official public holiday until Lincoln. This is pretty incredible, and I had absolutely no idea. Thanksgiving wasn’t an official public holiday until Lincoln took a break from, ya know, Civil War to make it one in 1863. Before 1863, presidents would either declare it a holiday or not, based on how they were feeling. Thomas Jefferson never proclaimed a Thanksgiving celebration. James Madison proclaimed a couple, but neither of them was in the fall. And so it went until Lincoln stepped up and made it an official holiday on an official date. 3. The first Thanksgiving involved no cranberry sauce or sweet potatoes. The Pilgrims ate cranberries, but not cranberry sauce. Cranberries were everywhere, and easy. But sugar… which is arguably an even more important ingredient in cranberry sauce than the cranberries themselves… was a huge luxury good at the time. Also… historical evidence doesn’t make any reference to cranberry sauce until 1663, an entire generation later than the first Thanksgiving. Sweet potatoes also were absent from the first Thanksgiving… because there weren’t any to be found. The Pilgrims didn’t have access to any potatoes, sweet or regular, so they had a completely potato-free diet. 4. The Detroit Lions are the reason there’s football on Thanksgiving. The Detroit Lions are also the reason a lot of other teams have gotten easy wins on Thanksgiving. Anyhoo, the NFL games that are now an indispensable part of Thanksgiving started back in 1934. That year, a guy named G.A. Richards bought the franchise… which, at the time, was called the Portsmouth (Ohio) Spartans… and moved it to Detroit. In order to compete with the Tigers for a market share of Detroit’s sports fans, he had to get creative. So he decided to schedule one of their games that season for Thanksgiving, against the defending world champion Chicago Bears. The game sold out, it was broadcast nationwide on NBC radio, it was a huge success… and the tradition stuck. The Lions have played 67 home games on Thanksgivings and are 33-32-2. (With the clock ticking on loss 33 as the Titans go to Detroit tomorrow.) The only years off were six years during World War Two. 5. Pumpkin pie didn’t become a staple until the second Thanksgiving. There’s no mention of pumpkin pie at the first Thanksgiving, and it would’ve been tough to pull off… the butter, flour and sugar for the crust were all in short supply. But there IS a record of pumpkin pie at the second Thanksgiving where, apparently, some Pilgrims decided that it was worth paying more money and allocating scarce ingredients to have pumpkin pie. I personally don’t think that was a good choice. To me, pumpkin pie is simply a whipped cream delivery system (much like how French fries are a ketchup delivery system). Thanksgiving desserts always let me down. I am shaking my head in frustrated anger that the Pilgrims decided to go with pumpkin pie and make that the tradition, instead of being smart and using their supplies to whip up an ice cream cake. Preferably a Cold Stone or Dairy Queen one. 6. The Macy’s Thanksgiving Day Parade used to use live animals instead of floats. 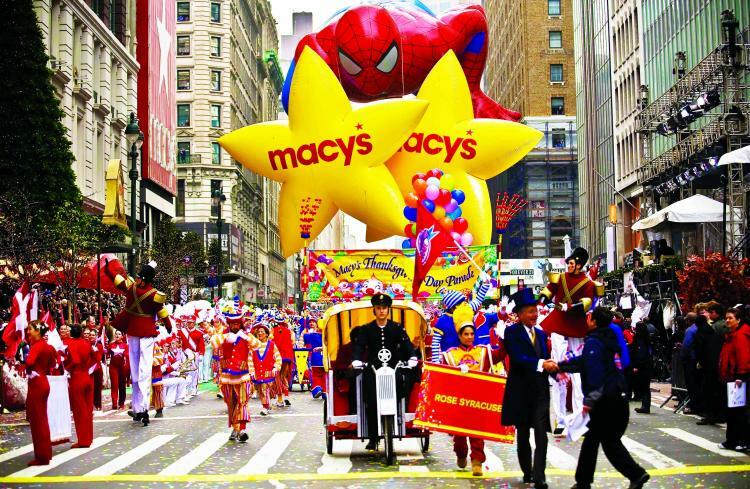 Macy’s started their parade in 1924… with live animals. They borrowed a bunch from the Central Park Zoo and paraded them around New York. That went on for three years. Finally, in 1927, Goodyear stepped up and made Macy’s a balloonshaped like Felix the Cat. Felix was the king of cartoon characters at the time. Any kids reading, he was iconic to the people then like the guy from “Go Diego, Go!” or whatever the hell crap you’re watching these days is to you. The first Mickey Mouse balloon wasn’t in the parade until 1934. A few other notably strange balloons: The Nestle Nesquick Bunny debuted in 1988; Sonic the Hedgehog in 1993; Izzy, the hideous mascot of the ’96 Atlanta Olympics, in 1995; and Kraft’s Cheesasaurus Rex in 2001. 7. Green bean casserole is only 53 years old. To my generation, there is no such thing as life without green bean casserole. After all, it’s classic American ingenuity: Take a healthy vegetable that doesn’t taste that good, surround it with unhealthy ingredient after unhealthy ingredient and boom — vegetables that we all want to eat. It’s just another proud soldier standing beside fried zucchini, eggplant parmigiana, stuffed peppers, carrot cake, cornbread, marinara sauce and cucumbers a la mode. But I had no idea my parents lived without green bean casserole. What’s now a Thanksgiving tradition wasn’t even alive during the Truman years. The green bean casserole was founded in 1955 by the people at Campbell Soup. The official reason: They were just trying to make up new recipes for their annual Campbell’s cookbook. The probable actual reason: They realized that no one is dumb enough to buy Cream of Mushroom soup without a good reason, so they got creative and it worked. 8. Black Friday was created by department stores… Cyber Monday is a complete myth. Since the beginning of department stores there have been Christmas season sales. The term “Black Friday” started in the 1960s in Philadelphia which, for a long time, was the mall capital of the world. How do I know this? Mostly from the movie “Mannequin”. The “black” in Black Friday refers to a store selling so much stuff that day that it gets its profits out of the red and into the black for the year. Now… Black Friday and its success has decades of hard numbers and empirical evidence to back it up. This whole Cyber Monday thing… where online retailers offer their big Christmas sales on the Monday following Thanksgiving… is a complete and utter myth. It’s like when Hallmark wanted to sell more cards so they invented Sweetest Day. There’s no evidence that people do more online shopping on the Monday after Thanksgiving than on any other day in the Christmas season. In fact, according to most studies, Mondays in December tend to see more online sales than that Monday in late November. But hey, by all means, go online on Monday and see if Amazon is willing to give you an extra five percent off of a tin of festive peanut brittle. You’re not being manipulated at all. 9. John Madden is not the creator of the turducken. John Madden may have popularized the turducken… and he may have a turducken accidentally tucked in one of his folds right now… but, despite popular belief, he’s not the inventor. In fact, he’s kind of like the Elvis of turducken… he took the idea from black people and made it popular. “National Geographic” found that the turducken (which, by the way, is a turkey stuffed with a duck stuffed with a chicken) was invented in southern Louisiana in the early ’80s. Also, quick additional fact. While it’s cool to do the three-bird stuff of the turducken, the world record for stuffing birds into other birds happened in France in the 1800s. A bustard (a large bird) was stuffed with a turkey, goose, pheasant, chicken, duck, guinea fowl, teal, woodcock, partridge, plover, lapwing, quail, thrush, lark, Ortolan Bunting and Garden Warbler. The Warbler inside of the Bunting was only the size of an olive. 9. You’re not the only one getting drunk with your high school friends tonight. The night before Thanksgiving is the single biggest day for bar sales in the United States. Bigger than New Year’s Eve. Bigger than the Super Bowl. Even bigger than St. Patrick’s Day. And it beats St. Patrick’s Day because people don’t just cram Irish bars, they cram all bars. Should I cover my AC unit during winter? Every autumn as the leaves drop and the cold temperatures roll in, homeowners start thinking about winterizing their homes and yards. But what about their air conditioners? Our customers often ask us whether they should be covering their air conditioners during the winter to protect them from the winter elements. Unfortunately, there is no perfect answer to this question as there are pros and cons to both covering and leaving it uncovered. While covering your air conditioner may keep it looking a little better in the long run, doing so can create a perfect habitat for critters, such as mice. These freeloaders like to use your covered up air conditioner as luxury living space to get out of the harsh winter conditions and may make Swiss cheese out of the wiring and other components in the unit. On the other hand, we also have had to replace the top portion of the air conditioner due to ice and other debris falling on them from the roof, which may have been protected if covered. So you ask what we would recommend? The answer to this may vary depending on a few conditions, like where you live. If you live in Florida where your air could be running a good portion of the year, then it really doesn’t make sense to be covering it, but here in New York where the temperatures can fall well below zero degrees and we can have feet of snow, it may be worth considering some sort of shelter. In our opinion, it is best to leave the unit uncovered as we see more repairs in the spring for units that are covered. However, if you have ice that often forms on the roof above your air conditioner, then we recommend putting a piece of plywood over the top of it to reduce the possibility of damage from it falling. For more information on check out our website, or give us a call at 718-885-3328!